Hanukkah is here! It’s time for the eight-day festival of lights. Hanukkah is celebrated with a nightly menorah lighting, special prayers and fried foods. It is customary to eat foods fried in oil, since the Hanukkah miracle involved oil. Whether you’re spending the holiday with a small group of friends and family or you plan to have a large group over, after the blessings are said, the candles are lit and the gifts are exchanged, it’s time to start cooking. From classic Hanukkah fare such as sufganiyah and latkes, to modern interpretations of your favorite Hanukkah meals, our Aprons team has provided several delicious recipes you should try this year. Our smoked beef brisket is one meal eaten during Hanukkah that is not fried. 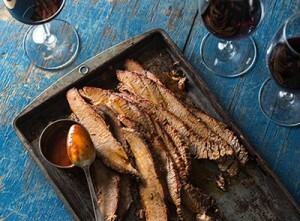 This Aprons Smoked Beef Brisket is an essential main course for any Hanukkah celebration. If you don’t have a grill and want a different flavor profile, try our delicious Roasted Garlic and Onion Brisket. You can either bake or braise it. Green onions in potato pancakes? Yes! Green onions add a refreshing and unique twist to traditional latkes. For your Hanukkah dinner, Green Onion Latkes can be formed ahead of time by arranging patties in a single layer on a baking sheet and chilling up to two hours. Surprise your guests with these tasty treats. For a non-traditional latke recipe that you and your guests will love, give these unique Zucchini Potato Pancakes a try. Continuing the fried food theme for Hanukkah, our Sufganiyah is a delicious treat that’s good any time of the day. 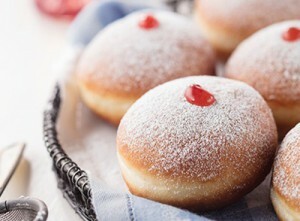 Sufganiyah is a round jelly doughnut that originated in Israel and is now eaten throughout the world on Hanukkah. It’s a deep-fried donut, filled with jam or custard and topped with powdered sugar. If you’re not in the mood for Sufganiyah after your meal, our Bakery department offers Seasonal Hanukkah cookies and a Hanukkah House kit (not available in all stores – check with Customer Service to order) you can design with your family and enjoy! 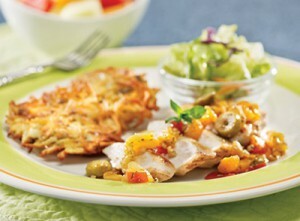 We hope you and your guests enjoy our delicious Aprons recipes. Share some of your favorite Hanukkah meals and traditions in the comments below. Happy Hanukkah!